Do you know how to brine chicken breast? It is like magic! The alchemy here is using a technique called “brining” to transform bland, rubbery chicken breast into something wonderful. It doesn’t take very long and it ensures your chicken will be moist. Everyone knows that eating dry chicken is like sucking on a hockey puck. If you can avoid it, you will. I also like using my slow cooker for a slow cooker chicken taco filling and for making a slow cooker whole chicken. I find that when I plan (and manage to get the chicken into the cooker in time), my chicken stays moist. Slow cookers are great for keeping liquid inside the dish. Brining, on the other hand, enhances juiciness by ensuring that the meat absorbs liquid before it is cooked. This “extra liquid” protects the chicken from getting too dry as chicken will lose liquid as it cooks. The best part is that it only takes 15 minutes! The chicken doesn't have to sit in a salt water bath for an entire day. If you have an extra 15 minutes, this step will change your life. My kids, who usually demand chicken thighs because they find breast too dry – love this take on chicken breast. I used small, boneless and skinless chicken breasts for this recipe. They were about 5-6 ounces each and I think if your chicken breasts are larger, you should cut them into smaller pieces so that the brine has a chance to infuse the chicken before you cook it. Do use kosher salt for the brining step. You can find it below the regular salt and it gives the best result. Smoked paprika can be found next the regular paprika and adds a whole level of flavor to the chicken. I use it a lot to add depth to a dish. It isn’t necessary here so don’t worry if you don’t have it. 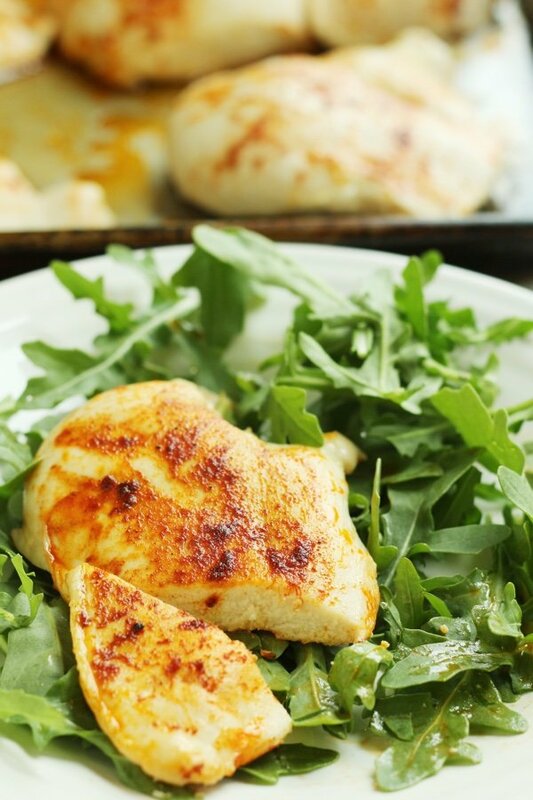 Serve this with a salad (I used baby arugula in the photo) and you have a simple, delicious, and low carb dinner. Have you ever tried brining chicken breast? First, mix ¼ cup kosher salt in a large bowl with 1 quart of warm water. 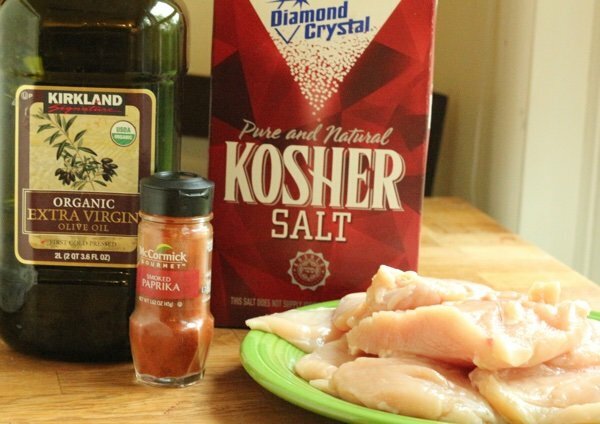 Immerse chicken breasts in salted water for 15 minutes and then rinse. Heat oven to 450 F. Pat chicken dry with paper towels and put on a rimmed baking sheet. Mix ½ teaspoon salt, black pepper, and smoked paprika in a small bowl. Brush chicken on both sides with the olive oil and them rub the spice mixture on both sides. Bake in the oven for 15 minutes until the chicken registers the internal temperature of 170 F. Let rest for 5 minutes and serve. I feel like the pre-seasoned / brined meats you buy at the supermarket are always too salty. Does this taste salty? The 234 mg of sodium doesn't seem too bad. Good idea to bake up a bunch of these for dinners during the work week, and to add to my lunch salads! Going to give this a try. This morning I actually took out boneless chicken breast to make for dinner. @Maria - I do know what you are talking about. Sometimes manufacturers even inject the brine. This is for a short period of time so it has the effect but not the saltiness of the packaged stuff. Brining is a great idea, though I find it unnecessary when cooking poultry in my convection oven, which produces surprisingly moist meats (in less time) virtually always! Snack Girl, have you tried/noticed any difference in the end result if you REFRIGERATE the poultry while brining, which other recipes I've seen suggest?? I normally brine or I marinate the chicken before I cook it. Where do you find 4 ounce chicken breasts? I have looked, since most recipes call for them, and none of the stores in my area carry them. I always have to buy the huge ones and cut them up, but that makes some recipes impossible - like one I found for stuffed chicken breast. Sigh. We love your blog dearly, but please please please take out the part about "until the chicken is no longer pink". The only reliable way to insure food is cooked to a safe temp is to measure it- not to check color. Color is never an indicator of safety! Btw, there is a wonderful photo on the Internet (which I have no idea how to link to) of 2 burgers side by side, where the one which is pink in the middle has been cooked to a safe internal temp, whereas the one which 'looks' well-done (i.e. brown all through) is still not up to the recommended temp. I threw that example in purely to illustrate that it is possible, not to mention delicious, to cook something all the way to the # recommended to be non-risky on the thermometer, but that the color of the food means absolutely nothing. Thanks for reading; going to try your chicken now(but with my totally easy & quick thermometer)! I've had good luck with poaching chicken breasts, then freezing for later use. Do you think there is any point in brining before poaching? Thanks so much for the recipe, just what I was looking for! The store-bought rotisserie chickens have been disappointing lately. My home baked ones usually taste like shoe leather. Does the salt need to be kosher? I only have regular. @Naomi - I have changed the post due to your comment. Thank you! @Patti - I found them individual wrapped in the "natural" meat section. don't know why they are there -maybe you could find them frozen. @Jane - I don't think brining before poaching would make sense because you are already cooking in liquid. @Bridget - Do use kosher salt! It has a larger grain and is the right salt for brining. I think it has different properties than table salt. Thanks so much for the feedback and questions! I have brined pork, never chicken. I will try this. Thank you. Hi Patti. I buy my chicken breasts from GFS stores. They come in 5 pound bags - frozen - but it's the only chicken I can find anymore that's generally a consistent size. They run around 4 oz each piece. I grilled the chicken! Delicious!! This is brilliant! Yes, I've brined before, mostly whole birds though. V8 slap for not thinking of this for making juicy chicken breasts! I might play around with your recipe and add whatever aromatics are on hand [smashed garlic, bay leaves, smashed peppercorns, rosemary, etc. Do you think it would be ok to defrost chicken breasts, in brine, in fridge overnight? Thanks Kathy and SG! Your comments only confirm that it is harder and harder to find smaller chicken breasts! When weighing chicken [or any meat] for weight loss, isn't it done after cooking? I just tried this today and the chicken turned out very moist and good. I used 2 larger breasts and just baked a little longer. I sliced the chicken to top 4 lunch salads. Thanks! I marinade boneless chicken breasts in low fat plain yogurt or sour cream, about 3 hours. I salt and pepper them before putting them in yogurt. Then I grill them like normal. I like it better than brine, the chicken is moist and almost silky.